Is there a better time to consider some of the finest ice creams ever made than in the middle of the Easter school holidays? 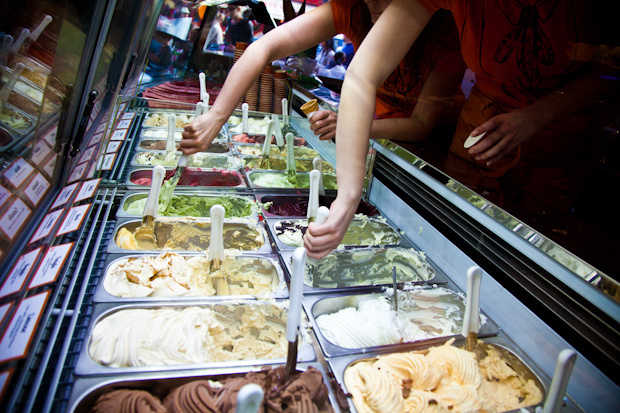 Gelato Mio is an independent start-up business making and selling a mouth-watering array of fresh ice creams and sorbets They opened their first shop in Holland Park on the 1st July 2008 and set up their factory and shop on the Fulham Palace Road in 2009. The Fulham shop closes for the winter months but re-opens as the weather warms. This year’s beautifully sunny spring (well, sort of until yesterday) has seen queues lined up to indulge in classic gelato recipes. You can watch their alchemy-like ice cream making taking place in the kitchens via a glass panel at the back of the shop. Having the factory in the building means that the preservative free gelatos and sorbets don’t come any fresher - making the Fulham shop the best place to visit. The pistachio gelato is amazingly good. And the sorbets are whisked so quickly during the making process it gives them a misleading creamy taste despite being diary free - I recommend the strawberry. The menu varies slightly as the seasonal ingredients change. Carlo Del Mistro was in his twenties when he started Gelato Mio with the stated goal of restoring the Italian gelato art to its former glory. He has worked with master ice cream makers from Italy to compile a range of classic dishes and now has eight stores around the capital. It is encouraging to see entrepreneurs such as Carlo do well in this economic climate. It’s particularly good to see a retail business like this expanding by breaking new ground in a fairly old industry. You can sample the wonderful gelatos and sorbets for yourself by visiting Gelato Mio’s shop at 495 Fulham Palace Road, Fulham, London, SW6 6SU. You can visit their website here; you can email them here; follow them on Twitter here and like them on Facebook here. Their telephone number is 020 0011 3907.